Hey garden friends, I'm going to be giving a class about growing garlic in Memphis on October 26th. I hope to see y'all there! The information is below. The Solar-Powered Girl-Powered Wash Station... finished! Back in June, I told you all about a brilliant young woman at Hutchison who designed, planned, and built a solar-powered vegetable wash station at the farm. Well, she's finished it! Here's the full story, from beginning to end. This past fall, I was busily tucking tiny kale seeds in to the warm soil of the Hutchison farm, when a freshman girl wandered in through the gate. "Hi, Mrs. Riddle! My name is Elizabeth. I've designed a solar-powered vegetable wash station that will allow us to capture the gray water from the sink into a cylindrical chamber that will clean the water using a small motor and a UV filtration system. Would you like to see it?" "I've created a budget for it and preliminary blueprints." Pulling myself together, I ask her which class this is for, and who's giving her credit for this. "Oh no," she says, "I'm doing this just for fun." For fun, I later find out, in between her classes, quiz bowl competitions, and running tech for two school plays, but I digress. Working with Henry Hampton, our Physical Plant Director, Elizabeth fine-tuned her idea and got her plan and budget approved. She decided that she wanted her station to be useful and educational, so she added a component to capture and sanitize rain water, because, as she said, "it's important for us to learn about water conservation." Parts were ordered, and the plan was set in motion. Elizabeth came out to the school over the course of three weeks during her summer vacation to build her design. Two wonderful members of the Hutchison maintenance staff, Carnell Benton and Napoleon Logan, helped Elizabeth with the build every step of the way. Even on 100 degree days, she could be found at the top of a ladder, nailing shingles into a roof, or unloading the latest shipment of lumber. She ran the show with grit and grace. Installing the solar panel. Photo by Cathy Barber. The younger kids (and, let's be honest, all of the adults) were stunned, and I could see the gears in their head starting to turn. The girls were full of questions. Their hands shot up in the air like popcorn as they asked her things like, "Did you have to make several versions of your plan, or did you get it right the first time?" and "How do solar panels work?" and "Where does the water go once it's used?" Elizabeth may have inspired an entire new generation of budding scientists and engineers! One of the greatest things about working with kids and teens is that they show you on a daily basis to never underestimate them. With just a little bit of support and the proper resources, Elizabeth was able to invent something new and useful. I can't wait to see how she changes the world. Way to go, Elizabeth! The whole crew. Photo by Cathy Barber. The finished product! Photo by Cathy Barber. On May 28, 2015, I got my foot tangled up in a lawnmower and kicked off the worst year of my life. The first thing I felt, after the panic, was embarrassment. I was sitting there, half-naked on the ground waiting for the ambulance to arrive (I'd ripped off my shirt to wrap around my foot to try and stem the flow of blood), and through the pain and the terror, I remember feeling just plain stupid. HOW could I have so flagrantly ignored the safety rules that I would never have let my employees or students disobey? I had my boots with me at the farm that day, but I decided that those blisters that the boots gave me were getting too obnoxious, and I'd just finish mowing this last little area IN MY CHACOS. The worst part was, I'd paid for my flippant disregard of safety rules before. I've dropped a T-post driver on my foot. I've accidentally kicked the sharp end of shovels as I ran in flip flops through my fields. I still didn't learn. I felt like a complete fool. Fast forward through 18 days in the hospital, seven surgeries, and weeks at home in recovery, I lost my big toe and my foot was being held together by pins and a device called a wound vacuum that still gives me nightmares. See that stack of papers? Trying to work from the couch. Photo by Jenny Brandt. At the time of my accident, my husband and I ran a non-profit training program for aspiring farmers together. We had big, overly-idealistic dreams about saving the world through the proliferation of sustainable farms. Between us, we made up half of the executive staff. Needless to say, neither one of us were able to give our attentions to work, and the employees were beginning to burn out from pulling all of the extra weight. (They were admirable and heroic, but even heroes need a break!) I threw myself into physical therapy to get back to work as soon as possible. I consulted with students by phone while bed-ridden. I graduated from wheelchair to walker to crutches to a slow walk. By the end of June, I was able to do seated farm chores with my foot propped up, like seeding or veggie processing. By mid-July, I was slowly working my way back into the fields. I perfected the art of seeding with my foot propped up. I was finally back up on my feet in the fall, only to be pushed back down again. As I mentioned, I used to train aspiring farmers. Farming is really hard work, and the truth is, most people can't hack it. During this time, a small group of former students who had failed out over the years for a variety of reasons got together and decided to harass and stalk both my husband and me. They embarked on an online disinformation crusade that would make the Russian intelligence service give them high-fives. This lasted for close to a year. Anyone who has ever been through prolonged harassment knows what kind of damage it can cause. At the time, I honestly would have preferred to lose another toe than endure the onslaught of relentless harassment. I'm not sure what makes people suspend better judgment and act in ways that are purposefully malicious. I don't know if they got it into their head that their failures were so fully a result of a moral or professional failing on my fault, that they felt justified in doing what they did. I even tried to empathize with the people that were hurting me, put myself in their shoes, and rationalize their behaviors. It's impossible, though. There is no justification for harassment. None. Dealing with months and months of harassment was almost more than I could bear. I became pregnant with twins, then lost one of the twins. I was still losing weight from the stress of the harassment well into my second trimester. I was scared. We would triple-check the locks at night and make sure all the curtains were pulled. I was scared to go to work. I was scared of losing my other twin. Every day, every mundane task, became a whirlwind of anxiety. But you know what they say, about the night being darkest just before the dawn? There came a day when I was sure I couldn't face another moment of false accusations, name calling, and malice. I couldn't take another day of feeling like that stress that I couldn't escape was killing my other baby. That day, a friend reached out to me to tell me about a similar situation she had been through. Another friend dropped soup off on my front porch. The next day, another friend reached out just to tell me he cared. A little bit at a time, things got better. Terrible, stupid accidents happen, mothers lose and grieve their babes they'll never meet, and human beings do cold-hearted, myopic, and selfish things. And things can still get better. Neighbors and friends brought me a hand bike to use while I couldn't use my feet! As it got better, I was able to better realize that they only reason that I was able to walk through this storm at all was through the love and grace of those friends and family who were there through the entire journey. They brought me smoothies in the hospital when I couldn't eat solid food. They hung up a porch swing at my house so I could sit outside while I was stuck at home. They threw me a surprise birthday party. They poured money into a GoFundMe to help me cover my bills, even though the whole damn accident was my fault. They came to my house EVERY DAY to change my wound dressings. They took my husband out for a beer to give him a break. They knitted me socks to keep my healing foot warm. They hugged me when I was sad. They walked my dog. They spoke up for me when I was being harassed. They gave me grace to be imperfect in the face of adversity. They welcomed my child. They never let me forget that I was loved. May 28, 2015 was the start of a year I didn't think I could survive. But things got better. They get better. The funny thing is, the year of trial by fire helped me better realize who I want to be, the friendships I want to cultivate, and what I want to do. It made me who I am, and I like who I am. I still carry the scars of that year, both obvious physical scars and deeper emotional ones, but even scars fade. I never thought that this could be true, but right now, save for an occasional night of uninterrupted sleep and a whole and healthy foot, there is nothing about my life that I would change. I am truly happy. I am content. I love my husband more than ever. Our child is the light of our lives. My friends and family are my rock and my joy. I love my job. I love who I am. I love my community. I share my story to say don't give up. You're not alone. It gets better. When they try to bury you, just remember that you're a seed. You had a good run, lefty. The girls at Hutchison School love their bees. Not only is it their mascot, but the school's resident honeybees play an integral role in the academic programs. Harvesting honey is everyone's highlight, and the girls are fascinated by the intricacies of bee colony life. When I started at Hutchison, there were just two hives. The boxes were starting to fall apart, and the bees were showing signs of aggression. I knew I wanted to expand the apiary, help calm some of the bee aggression, and update the bee's lodgings to make it more kid-friendly, but I wasn't sure of the best way to do this. Luckily, my dear friends Rita and Richard Underhill of Peace Bee Farm are bee experts and consultants. Richard is a Master Beekeeper. They came over to Memphis a few weeks back to help me come up with a plan. First, we decided to get rid of the ten-frame medium hives and switch the existing colonies over to eight-frame medium hives. Each medium frame of honey weighs about six pounds, so the smaller and lighter we can make our equipment, the better it is for our kid-beekeepers. We also decided to get two new packages of bees, and we ordered eight-frame equipment for them, too. The hives arrived first, and one of our third grade classes signed up to come help put the hives together. The girls installed beeswax-coated plastic foundations into wooden frames and painted the hives. Next, the bees. We ordered two three-pound packages of Italian honeybees from Bemis Honey Bee Farm in Little Rock, Arkansas. Last Saturday, we drove to Little Rock to go pick them up. When you order bee packages, they usually come in a small box, like you see below. 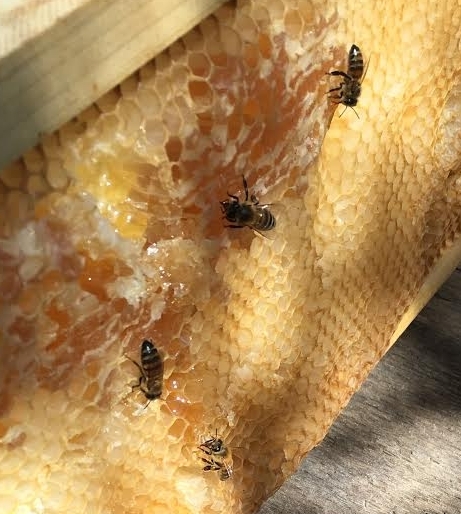 There's a little cell inside for the queen and her attendants, and a can of corn syrup with holes punctured into it to slowly feed the bees during their journey to their new homes. On Sunday, Richard and Rita met me at Hutchison to help install the bee packages and try to diagnose what was going on with those aggressive bees. (More on that later.) Richard also moved the frames from the existing ten-frame hives into the eight-frame hives. First, we placed the bottom boards of the hives on their platform and then put one box on top of that. We sprayed down six of the frames with a spray bottle containing sugar water, then placed them in the box, leaving a gap in the middle. Next, we turned our attention to the queen. She was in a little wooden and mesh wire box with a sugar candy plug, topped with a cork. She was definitely sending off some strong pheromones, because her little cage was covered with layers of attendants. We pushed them aside gently to make sure she was okay. She was plump and marked with a yellow dot. Then, Richard showed me how to place the queen cage in the new hive. We took the cork out of the end of the cage that had the sugar candy plug. We gently probed the candy to make sure that it was soft and pliable enough for the bees to chew through it. Then we placed the cell snugly in between two of the frames at an angle, with the candy facing up. Richard explained that you keep it facing up so that if an attendant bee dies, it doesn't fall down and block the queen's exit from the cage. Shaking three pounds of bees into the new hives. Once the queen was safely ensconced in the hive, we took the syrup can out of the bee package, turned it upside down over the gap in the hive, and shook it like a bottle of Heinz 57 ketchup. The bees came tumbling out into the hive. It took several good shakes! Then we placed the final two frames into the hives and placed a feeder on top of the hive. We filled the feeder with sugar water to help nourish them while they expend lots of energy building out their new honeycomb. We placed plastic mesh floaters in the sugar water to help the bees access the syrup without drowning, then placed the inner and outer covers directly on top of the feeders. And voila! A new hive is born. I'll feed them once a week until they've drawn out their comb. Over the next few weeks, I'll add another brood box, then a queen excluder and a honey super. I opened up the hives today to check and make sure they got the queens out. They did. I noticed an unusually high population of small hive beetles in one of the hives, so I'm keeping an eye on that as well. Do any of you keep bees with kids or students? What do you do to make it kid-friendly? A few weeks ago, an upper school teacher happened to ask me in passing, "Do you know anything about Russia or Russian food?" She was wrapping up a unit in her Comparative Governments class about Russian agriculture, and she wanted to celebrate by making some kind of Russian dish with her students. A buttery, fluffy, airy, delectable blin. The timing of her request was perfect. We spent Thursday afternoon during Maslenitsa week making delicious blini and talking about various Russian Orthodox traditions. Well, this teacher's Human Geography class got wind of her Comparative Government's blini celebration, and they were jealous. They wanted to make blini, too. The Human Geography girls weren't studying Russia, but they just so happened to be in their modern agriculture unit and were learning about farm subsidies. Making blini provided a great opportunity to talk about that. Blini has five ingredients (flour, eggs, sugar, butter, and milk), and they're all heavily subsidized commodities. We worked out the price of the blini batter we made, and it came out to about $7. If you took away farm subsidies, though, the cost of the same bowl of batter jumped to about $22. That's a huge increase! We made a platter full of blini and sat down to a table of different fillings, both savory and sweet: smoked salmon, sour cream, jams, and honey from our school apiary. Over our meal, we discussed the pros and cons of farm subsidies. Some of the girls came from families that owned farms, and they provided personal perspectives. They noted how subsidies help keep farm families stable and therefore helps regulate our national food supply. Other perspectives were offered, too. Some girls didn't agree with how farm subsidies were distributed and didn't like that their tax dollars supported that. We also talked about how in a global food marketplace, our system of subsidies makes our food cheaper than food from farms in other countries. That can lead to food insecurity and systemic poverty in already unstable regions of the globe. I love how food can be a catalyst for a variety of conversations and learning experiences. If you want to make blini with your family, the original recipe from my high school blini making days is below. Separate the egg yolks from the whites. Stir sugar into the egg yolks, then add milk slowly while stirring. Add a dash of salt and melted hot butter. Add flour very slowly while stirring the mixture and smoothing the batter. Whisk egg whites until they're airy and fluffy, but not stiff. Fold them into the batter. Add about 1/3 cup of the batter to a hot frying pan and circle the pan around to spread the batter evenly over the surface. When the edges appear golden and small bubbles appear in the middle, flip it over and cook another minute or so. No need to add oil to the pan. There is plenty of butter in the batter. Serve with smoked salmon, sour cream, and dill for a savory dish, or jam and sour cream for a sweet option. Whipping egg whites by hand for true Russian street cred. I spent International Women's Day with 50,000 of my favorite ladies. I love working at an all-girls' school. I get to celebrate the work of bright girls and strong women every day. This International Women's Day was especially fun, because three classes of Hutchison Honeybees (our school mascot!) joined me for an early spring inspection of our school apiary. This time of year, there are only female bees in the colonies, and we cracked open the hives to see what they were up to. The first thing that we noticed were the small hive beetles. According to Master Beekeeper Richard Underhill, the honeybees don't actually kill the small hive beetles that invade their hives. Instead, they build little jail cells out of beeswax to keep them isolated. They even feed their prisoner beetles. Isn't that incredible? This is the time of year that many bee colonies die from starvation, because not much is in bloom yet. To keep their population levels strong, I brought along a couple of frames of capped honey that I saved from the fall to put in their hives for the bees to eat. The girls passed around a frame of capped honey, and we took out a partially-emptied honey frame from one of the beehives to examine the differences. One thing is for sure, honey is heavy. I showed the girls how the bees communicate danger to their fellow bees. They raise their backsides up in the air and release an alarm pheromone. The girls were amazed at the different ways that animals can communicate. Honeybees don't have mouths and tongues to form words, they observed, but they can communicate through scent. The bees seemed a little agitated, so we closed the hives up early and didn't inspect their brood. (I'll do that some soon time when there aren't a bunch of kids around!) We're going to be adding new colonies to the apiary soon, and the girls will get to help with that process. Seeing the girls' excitement as they learn about honeybees is one of the sweetest parts about life at Hutchison. Bees cleaning up an old honey frame. I first saw agrostemma at the Memphis Farmers Market about eight or nine years ago. I was a recent college graduate, and the full weight of my student loans had just come crashing down on my head. I definitely didn't have a lot of discretionary income. Budgetary concerns no longer mattered once I saw those agrostemmas. It was love at first sight. I bought the biggest bunch of those delicate, wispy stems as I could carry and made my way home with them, good intentions for vegetables be damned. I proudly displayed them on my kitchen table, and to my surprise and delight, those gorgeous blooms lasted for close to two weeks. I was hooked. I tried a couple of different times to grow agrostemma over the years, but it never went well for me. I started my seeds in late winter or early spring, but both times it got too hot for the plant before I ever saw a blossom. Last year, I read Lisa Mason Zeigler's book Cool Flowers, and I started wondering if I could apply those same principles to my elusive agrostemma dreams. This photo was taken about a month ago. Pretty good for January! I ordered both the Ocean Pearls and Purple Queen varieties from Johnny's back in the fall and started the seeds indoors under grow lights in October. We had a warm fall here in Memphis, so I planted them outdoors about six weeks later. This bed of agrostemma has grown all winter long under row covers. The darker days and cool weather helps to elongate the stems. I've had to pull a couple of the plants due to stem rot, but once I took the row covers off and allowed for more airflow, the problem cleared up. These stems are over two feet tall now, and they've even started to send up little buds. In FEBRUARY. Have I mentioned that it's been ridiculously mild? I'm keeping my fingers crossed that we don't get another killing freeze before I get to enjoy these blossoms. I've waited a long time to have these grace my kitchen table again. One of the best things about growing for a school is the freedom to explore and learn about new crops right alongside my students. This winter, I got a bee in my bonnet to try out a crazy crop I've never grown before: Dill's Atlantic Giant Pumpkin, the granddaddy of all giant pumpkins. I love the whimsy of a giant pumpkin. It brings to mind images of Hagrid's garden or Cinderella's carriage. There's a problem, though. I have horrible luck with all plants in the squash family. Growing without the aid of synthetic chemicals, I can only get one or two early rounds of squash from a plant before I'm beaten my two greatest nemeses: squash bugs and squash vine borers. To be honest, I'm a little nervous about growing a pumpkin at all, much less the world record-holding species for size and weight. Go big or go home, right? If everything goes well and I actually produce a pumpkin, it won't be ready until fall, but it's time to start the growing process now. Here's what the bed looks like now. Double-digging is a soil preparation technique associated with the Biointensive growing method. According to Ecology Action, double-dug beds "aerate the soil, facilitate root growth, and improve water retention." Soil fertility is maintained through the heavy use of compost. To get started, you measure off the area that you want to dig. I'm starting with a 2 x 20 foot section. I set out flags to show divide the area in 2 x 2 foot squares. Before you dig, please make sure that the area is free from water or gas lines. Start with your first square and shovel the top 12 inches of soil into a wheelbarrow. Then, take a pitchfork and loosen up all of the newly-exposed soil underneath. I don't move on until I can sink my pitchfork in 12 inches without effort. Move on to your next square. Shovel the top 12 inches of that square into the empty hole you just created. Again, take your pitchfork and loosen the exposed soil. Repeat that process with square after square. When you reach the end, fill the final hole with the soil waiting in your wheelbarrow. To ensure that I'm not compacting the soil when I'm working in the beds, I stand on a plank in order to more evenly distribute my weight through a larger area. I've got a lot more of this bed to finish. This is an intense workout, so my back demands that I take my time. I'm getting started now so that I can be ready to transplant pumpkins into the bed by Zone 7's April 15th final frost date. Stay tuned. You can follow along with #TheGreatPumpkinChallenge on my social media pages. Look at that nice, fluffy soil! Now where did I put that Instagram filter that removes all those weeds?